Friday July 2 will mark the 60th birthday of a unique English rugby player. The birth of Bob Mordell was not rugby's only notable event in the first week of July 1950 - it also saw an All Blacks v British & Irish Lions Test decided by a winning try from home captain Ron Elvidge, playing on in spite of injuries so serious that they ended his career - but it does have a singular distinction. More than 1300 men have won the jersey with the red rose motif. Mordell is the only one of them who could give his birthplace as Twickenham. The west London suburb was also to encompass the whole of his international career. A rugged Rosslyn Park back-rower who could also play lock, he had been pressing for England selection for a while prior to his eventual bow. He had played in trials in the two previous seasons as well as being a member of the Middlesex team that won the County Championship in 1976, when he played lock, and was runner-up to Lancashire in 1977. He was finally called up for the second of England's matches in the 1978 Five Nations Championship, at home to Wales. This match is now remembered for an extraordinary display by Gareth Edwards on the day when he became the first Welshman to win 50 caps. It was, as England prop Mike Burton has remembered, an occasion which displayed one of his greatest qualities: "His performances were superb on days when it was hard to be good." This was one of them. The weather was foul, although not all the liquid coursing down the packed open terrace where many Welsh fans stood had fallen from the sky. England were, as they usually were even during the 1970s, competitive up front. Edwards, though, controlled the game with an incredible display of tactical kicking - highlighted by a moment which lives in the mind's eye 32 years on. The scrum-half burst away from a scrum close to the touchline before rifling his clearance 70 yards. Burton remembered: "We could win two or three balls in succession, batter our way upfield and be poised for an attack on the Welsh line, then Gareth would send the ball rolling…into our twenty-five and we had to start again." It was a performance which, Burton reckoned 'broke our hearts'. Two Englishmen had particular reason for disappointment after a 9-6 Wales win in which all the points came from penalties. Fullback Alastair Hignell came in for much unfair criticism for narrowly failing with a late equalising shot in conditions in which it was an achievement to lift the ball from the quagmire. And that Welsh lead, secured by Phil Bennett's 72nd minute shot, came from a penalty conceded when referee Norman Sansom penalised Mordell at a ruck. Former Wales back-rower John Taylor recorded that after the match Mordell, "made a great fuss about the decision being wrong, but he was the only person at Twickenham that thought so." It was not Mordell's first bad experience on the ground close to his birthplace. Two years earlier he had been sent off early in the John Player Cup Final that saw Gosforth become the first club to take the trophy to the north of England. The selectors were clearly unimpressed and the experienced Peter Dixon was restored for England's next match. Mordell was not entirely discarded, going on the 1979 tour of Japan, but that 80 minutes at Twickenham was to be the sum of his international career as he took himself out of contention by signing professional forms to play rugby league with Oldham. He earned a reputation as a hard man in league as well, although on one occasion came off worst in a contretemps with Welshmen Paul Woods - for whom 'hard man' was only the beginning of the story - and wound up with a broken jaw. He is far from the only Englishman with one cap against Wales, but was one of the most recent. Only three men since - back-rower Andy Dun in 1984 and the Sale duo of wing Steve Hanley and ex-league centre Barrie-Jon Mather in 1999 - have been added to the list. There are a number of reasons for this, above all the rotation of Five Nations fixtures. When England v Wales had a fixed point at the start of the season, it was naturally enough the occasion on which England tried out newcomers. 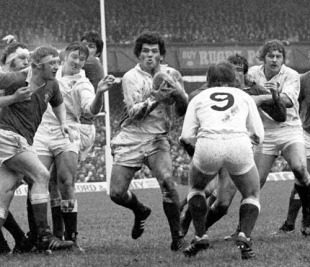 More than half of the 871 Englishmen capped between the first match against Wales in 1881 and the rotation of fixtures in 1974 made their debuts against Wales. England also now have many more matches, and are naturally enough likelier to try out newcomers in non-competitive internationals. Two hundred and seventy three men have made their debuts for England in the 32 years since Mordell was first capped. Only 23 of them have started against Wales. Nor can the selectors have been entirely unhappy with the six debutants they chose during the 1978 Five Nations. The other two debutants against Wales were outside-half John Horton and centre Paul Dodge, who went on to play in the 1980 Grand Slam team. Dodge, whose name belied a solid, straight-running style, was to win 32 caps - then a record for an England centre - seven as captain. Other newcomers that year included No.8 John Scott and lock Maurice Colclough, also stalwarts in 1980 and beyond. The sixth, fullback David Caplan, was to win only two caps, but this was in a good era for English 15s - his competitors were Hignell and Dusty Hare - and he made a highly favourable initial impression.